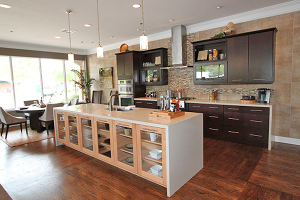 Ashton Woods Homes recently put the finishing touches on a new contemporary kitchen at its Atlanta design center. This new kitchen offers homebuyers a glimpse of the customization options they can expect from the builder. It showcases several designer touches, with clean lines and a modern color palette. More than just a simple cooking space, this kitchen represents the centerpiece of an Atlanta new home. The kitchen island features a large, single-bowl undermount sink with a contemporary-style 90 degree Moen faucet. The countertops are Silestone quartz, a surface that gives the appearance of concrete. Mitered-side Silestone legs continue the clean lines of the kitchen counters to the Lausanne Timberlake cabinets. The contemporary kitchen also features glass accents, which is a sought-after touch in today’s market. To learn more about the personalization options available for your Atlanta new home, visit the Ashton Woods Homes website.